Everyone calls Albania, Albania. Apart that is from the Albanian's for them they live in Shqiperi. I haven't visited the Greek mainland (yet), but on my visit to the Balkans I made it from Albania to Corfu, and spent a couple of days on the island before catching the boat up to Italy. 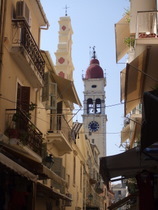 Corfu is an pretty little island, but when I was there the Pound .v. the Euro wasn't working to my advantage, and everything was rather expensive. Especially since I'd some from Albania where everything was much cheaper! I hired a car and headed into the hills, the bad news was that the map that I had wasn't very good and only showed the main roads. As soon as I headed off those I was relying on the road signs, however they are rather patchy at the best. At one point I ended up in a dead end on a road with a steep drop off the mountain. A 27 point turn got me back down, but it was quite a scary event!